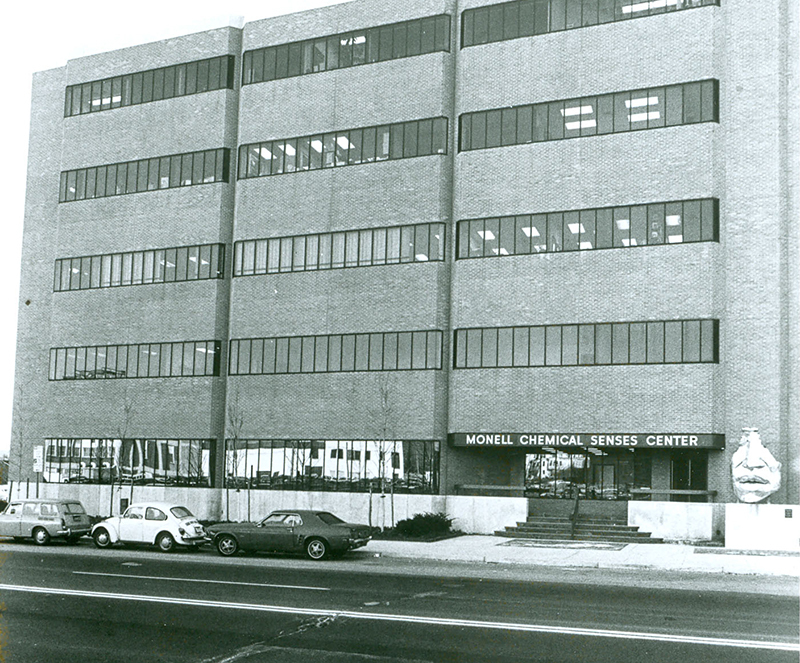 Next year, Monell will celebrate its “golden” anniversary, marking 50 years since we were founded in 1968. Ahead of this milestone, we recently celebrated another “golden” event – the statue standing outside our main entrance had its gold finish restored. 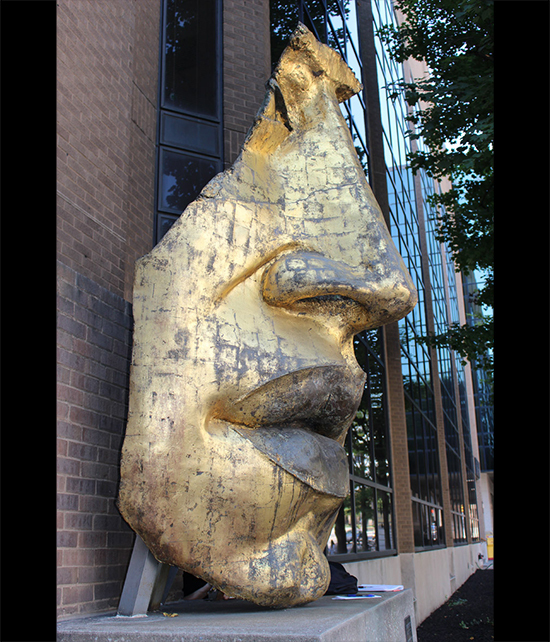 The sculpture’s official name is “Face Fragment,” and it was created in 1975 by Philadelphia sculptor Arlene Love. So how exactly did Monell’s iconic golden statue come to be? 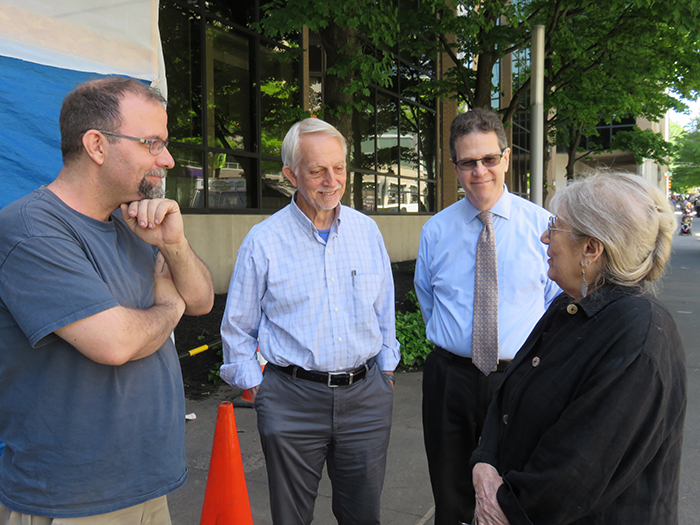 As part of the Philadelphia Redevelopment Authority’s Percent for Art Program, Monell’s leadership invited artists to submit ideas for a sculpture soon after the young Center moved to its present location in 1971. Ms. Love was one of a number of artists vying for the commission. Several Monell members worried that Face Fragment, with its large nose and lips, was just too literal for an institute devoted to smell and taste. Others were concerned that Face Fragment didn’t highlight the brain’s importance in interpreting sensory inputs. Ultimately, the final decision came down to one woman: Patricia Kind. A long-term supporter, benefactor, and Board Member of Monell, Mrs. Kind donated the funds to construct the Center’s statue. And she stood steadfastly behind Face Fragment, finally convincing Monell’s leadership to select Ms. Love’s design. 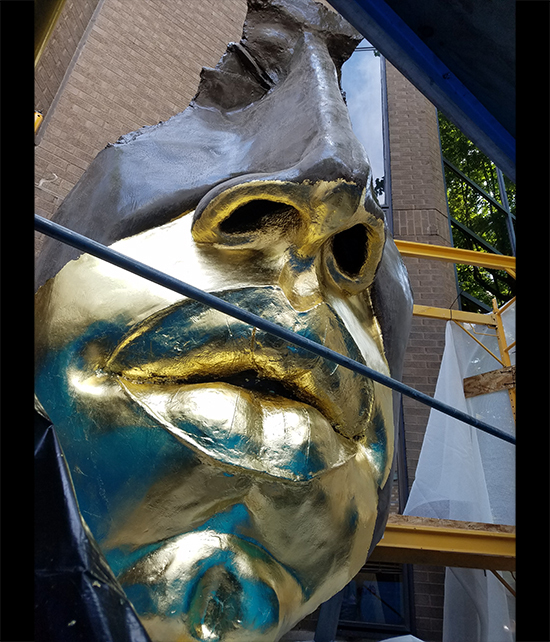 For a ten-foot high, 500 pound, resin and fiberglass face – which sits on a four-foot tall pedestal – Face Fragment is surprisingly relatable. Ms. Love designed the face to sit comfortably in the diverse West Philadelphia neighborhood, and intentionally sculpted it with features that were not specific to any ethnicity or race. The sculpture was originally coated in bronze, but Ms. Love soon replaced the patina with shiny gold leaf, a more durable option for the outdoor statue. Then, in the early 1980s, Face Fragment underwent its first regilding. Judy Wellington, a Monell Assistant Member at the time, oversaw this process. During the most recent restoration, Donna Kupniewski, Monell’s current Director of Facilities Management, was in charge. And Ms. Love herself was also involved in the process, serving as a resource for the restorer, Adam Jenkins. In the decades that Face Fragment has stood in front of the Monell Center, Monell scientists and personnel have grown deeply attached to it. During the past few months, we collected memories, thoughts, and other musings about Face Fragment from past and current Monellians and friends. Enjoy them below, along with photos of the restoration process. My brothers and sisters and I have always been inspired by our mom and her love for Philadelphia. She funded Face Fragment’s creation, and we thought it fitting to honor her memory by supporting its restoration. Monell’s leadership in the field of flavors and fragrances makes it the ideal place for the statue. 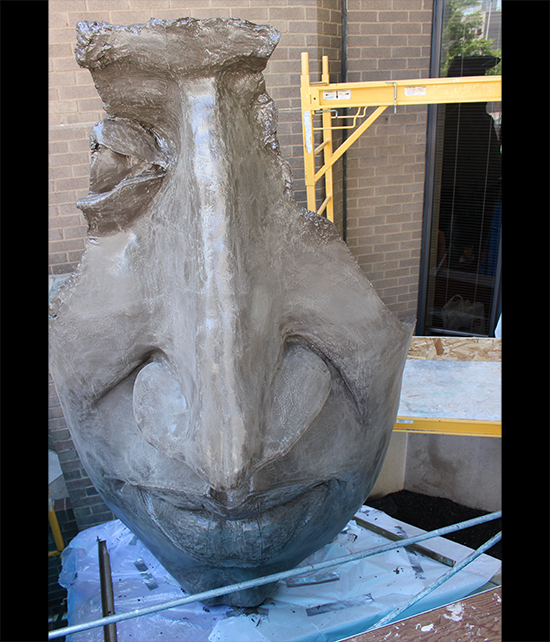 The Face Fragment statue is recognized throughout the world as the public face of Monell. The regilding is an emphatic statement of our commitment to the future of chemical senses research for the next 50 years and beyond. Over all these decades I see news about Monell in the press, and I feel so thrilled to be associated with the Center. Face Fragment was quite literally my first introduction to Monell. It greeted me every day as I went to work and still serves to help me explain to friends where Monell is in West Philly. 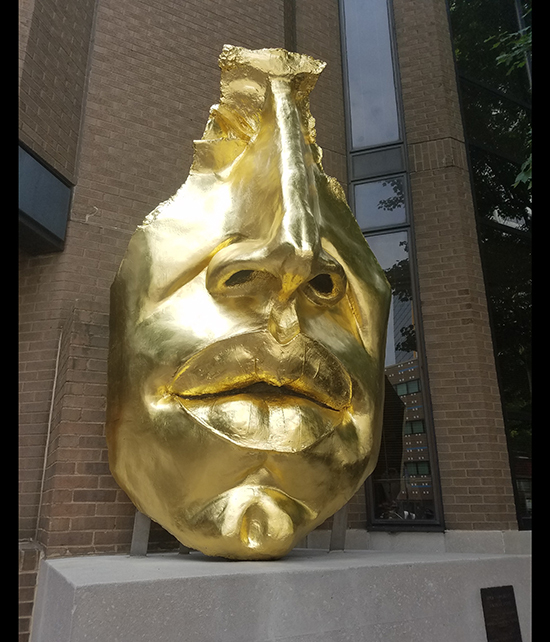 Everyone seems to know the gold face statue on Market Street. For me, it exemplifies the focus of our research. 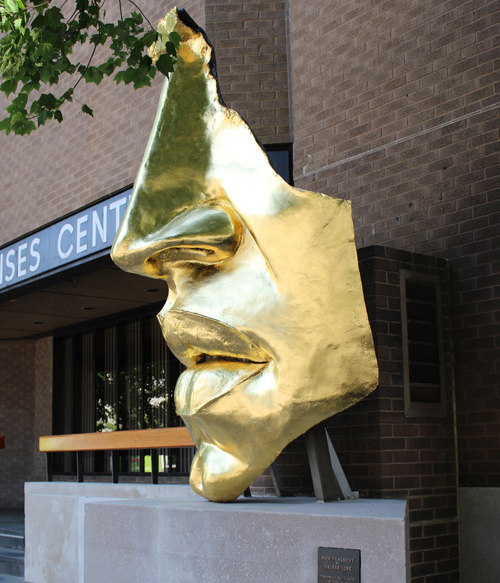 The sculpture symbolizes Monell for many people familiar with the area, and the restored gold color gives a vision of the richness of our Center and our research. Face Fragment symbolizes the two ways Monell contributes to Philadelphia, both through our scientific achievements and as members of the community. In my work with the Monell Foundation, I often see Philadelphia-based grant applicants refer to Face Fragment. One in particular asked if their application would receive more attention if they submitted a photo of their leadership standing next to the sculpture. We have Pat to thank for her foresight in choosing Face Fragment over other statue designs. Monell’s sculpture is now an iconic symbol of the Center throughout the world, and we welcome its restoration to its original luster. To me, Face Fragment and the Monell Center are synonymous. I cannot imagine either without the other – they are one and the same.